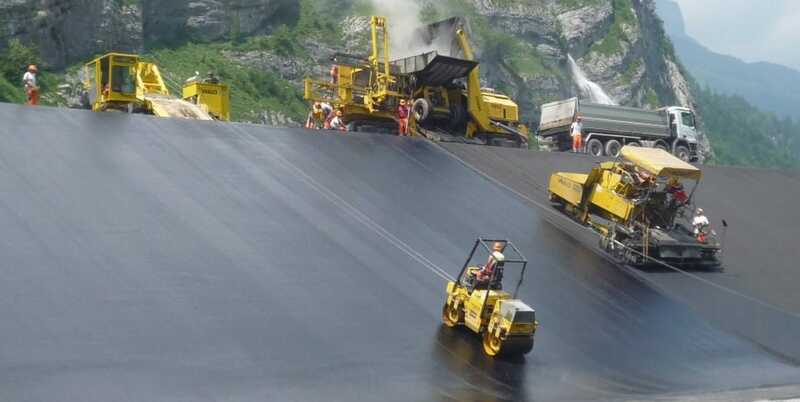 The pumped storage hydro power station at Glarus had to be expanded. One element of the project involved enlarging the capacity of the equalizing reservoir in the valley. To achieve this, WALO worked on providing a second equalizing reservoir to the north of the current one. A channel linking them allows water to move between the two so their levels correspond. The existing terrain forms the east side of the reservoir while a dam was built on the west side of the new reservoir. The crest of the dam is 813 meters above sea level while the base of the reservoir is 11 meters lower. The new reservoir is located within a groundwater protection zone which means the work had to meet a number of special requirements. Once the proﬁle of the new had been prepared by the excavation contractor, it was covered with a layer of filter ballast. A binding layer was then applied followed by a sealing layer and a coating of mastic which protects the reservoir lining against the elements and UV radiation. An asphalted road on the crest of the dam was also built to allow access for operators and maintenance staff during the service life of the facility.